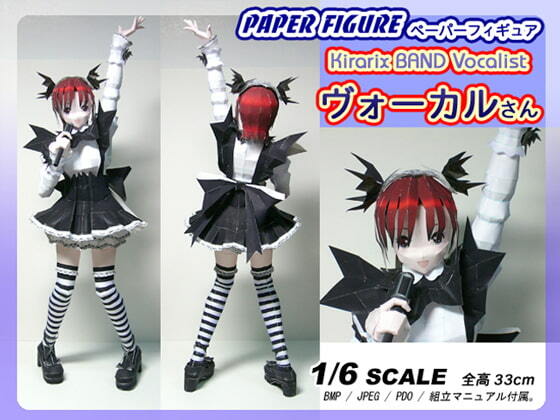 This is a paper craft of the vocalist from the circle's animation "KirariX BAND." How to assemble manual is attached. For samples, please visit the following website. Just bought it and its gonna be a tough one to build but a little easier than the maid. Unlike the maid from the same circle this one doesn't have other options for the looks. From examining the files there no actual body to build only the clothes legs and a frame that you use to hold them together and There are less parts compared to the maid model. Get the pepakura viewer to view the .Pdo file it helps a lot when building it. Scheduled release Feb. 10, * Release schedule subject to change.